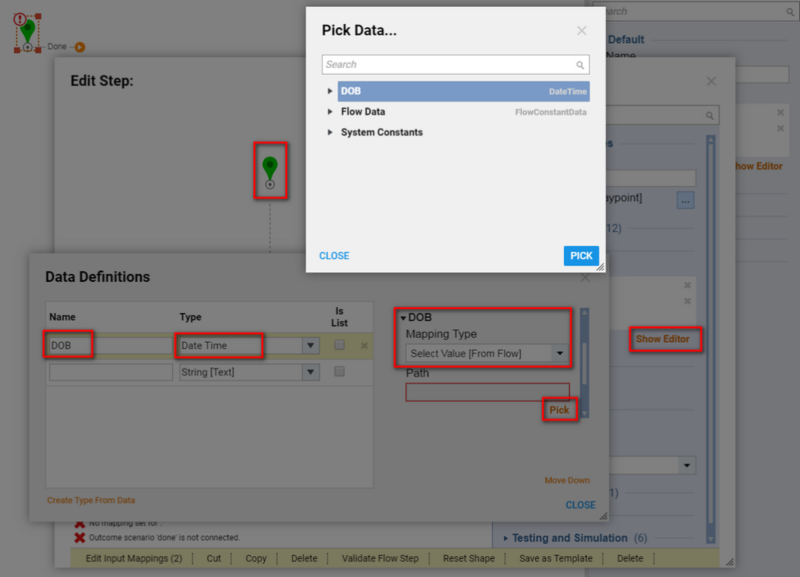 This tutorial demonstrates how to use Validation Rules	on Forms in Decisions . Validation Rules	evaluate a form value and return a “True” or “False” outcome, depending on whether the form value satisfies the rule’s condition(s). 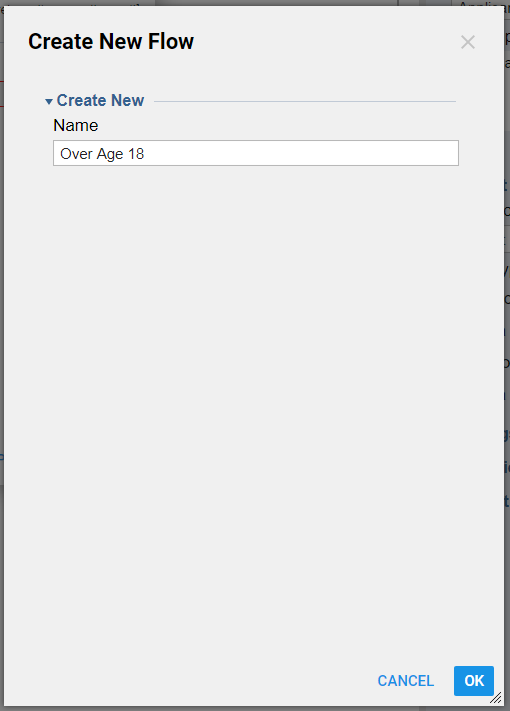 IfValidation Rule returns “False”	, validation brakes and custom message is displayed on the Form control. The platform includes several form validation rules, found under System > Designers > Catalog > System Defaults > Default Form Validation Rules. To keep all form validation rules together for organizational purposes, you could create additional validation rules here (however, this is not required). In this scenario, a minimum age for an applicant is at least 18 years old. A validation rule will evaluate date of birth of the applicant against the current date and enforce this business rule for minimum age. 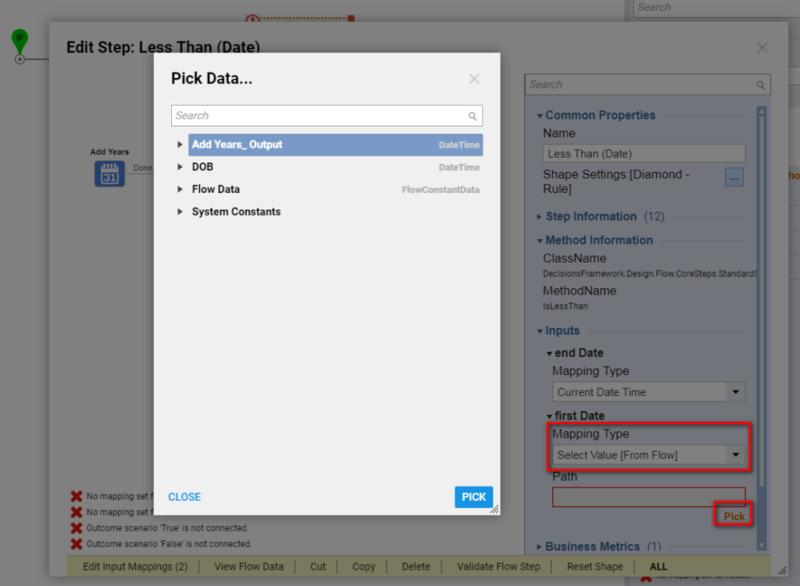 Our example validation rule will expect a date. If the date of birth plus 18 years is earlier than current date, the rule will return a truthful outcome. Otherwise, it will return false and show validation message. We begin in the Designer Folder	with clicking Create Rule > Create Rule	on the Folder Actions Panel. 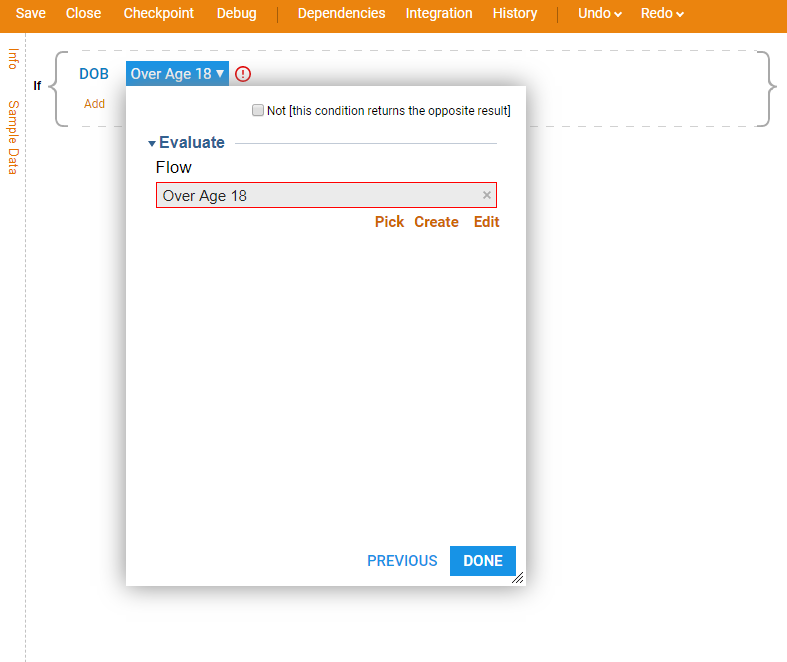 In the resulting window we Name	the Rule	“Applicant Over Age 18” and click Ok	to proceed to the Rule Designer. Our Rule	needs “Date Of Birth” Date input to evaluate. In the Start Rule	window we click Show Editor under Rule Input Data	to define inputs. 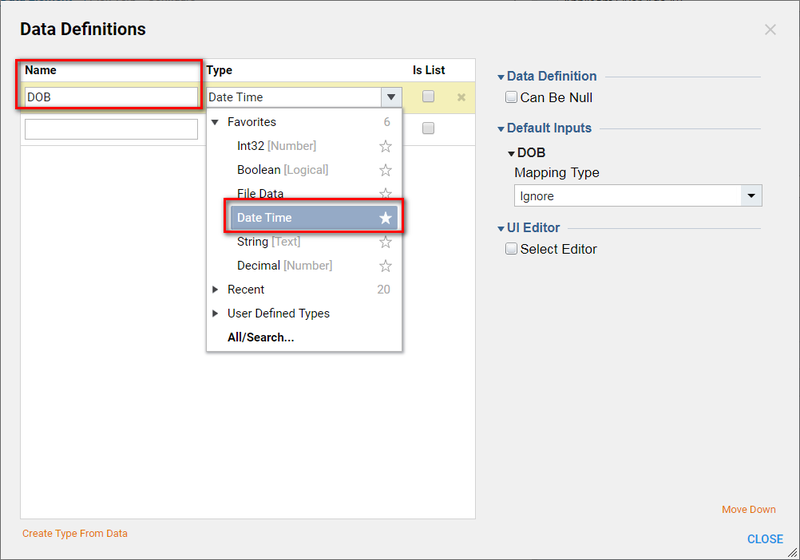 Then, in Data Definitions window we Name	our input and pick Date Time	data type. Click Close	to save and continue. 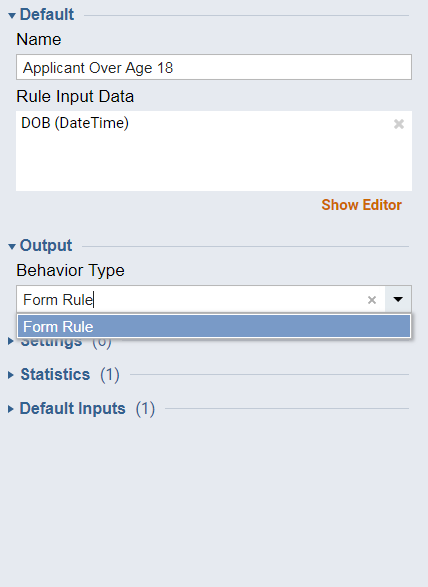 Rule Input Data is configured and we click Add New Rule Step	to start building our Rule . In the resulting window we pick our DOB	data to evaluate and click Next	. To evaluate our date of birth value we are going to create a simple Flow instead of a verb. We expand Common > Evaluate	category, pick Evaluate	and click Next	. Then, we click Create	under Flow	picker. 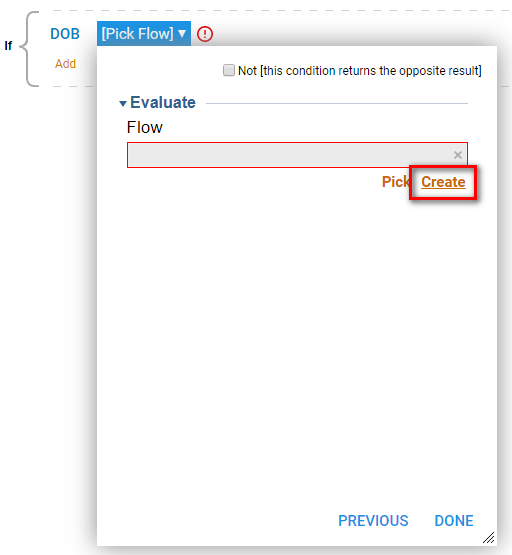 We Name	the Flow and click Ok	to proceed to the Flow Designer. 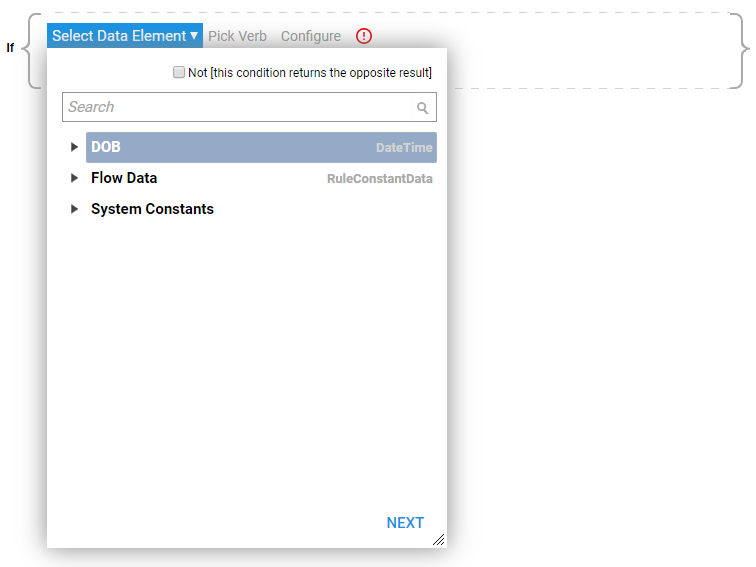 In the Flow Designer we need to create a Date Of Birth	as a Flow Input	. 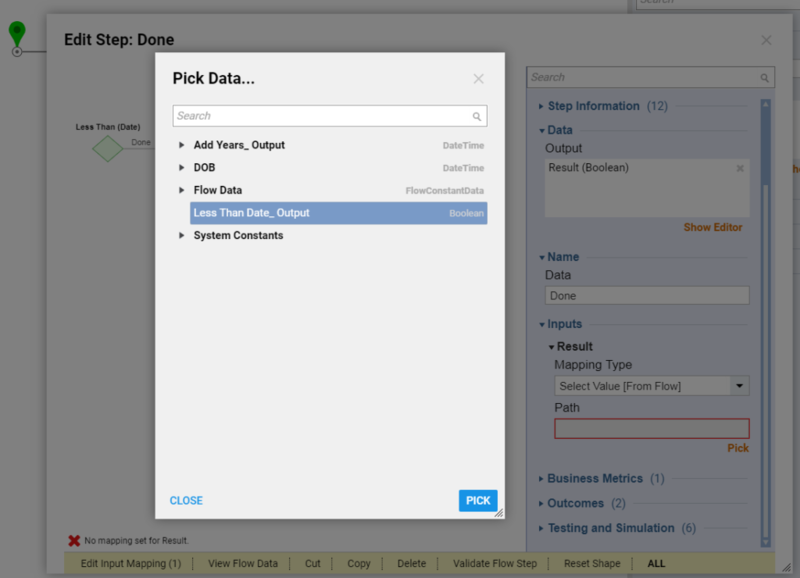 We selectStart Step	and in the Step Editor window we locate Flow Input Data	settings and click Show Editor. 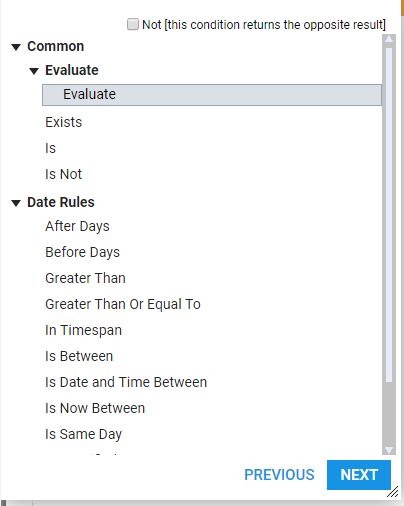 In theData Definitions	window we Name	our data and pick Date Time	type. 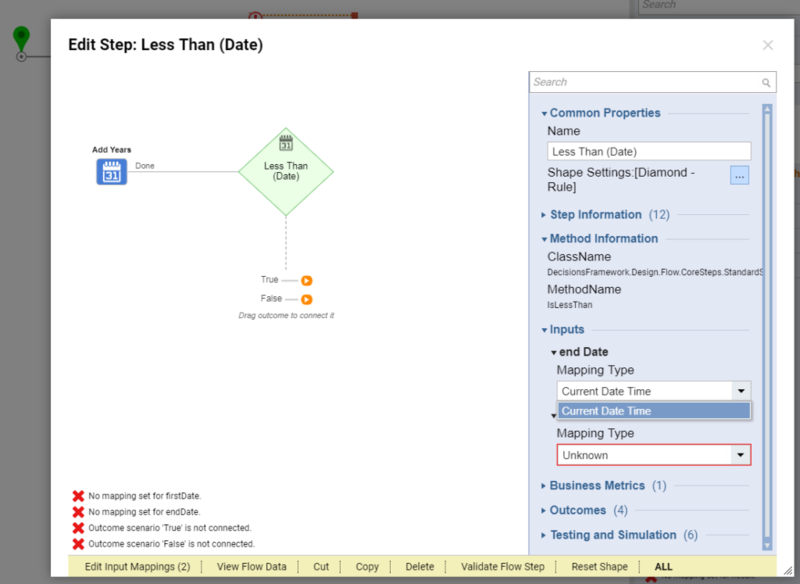 Then, in the Mapping	settings for our date we Select Value	of DOB date. Click Close	when finished. 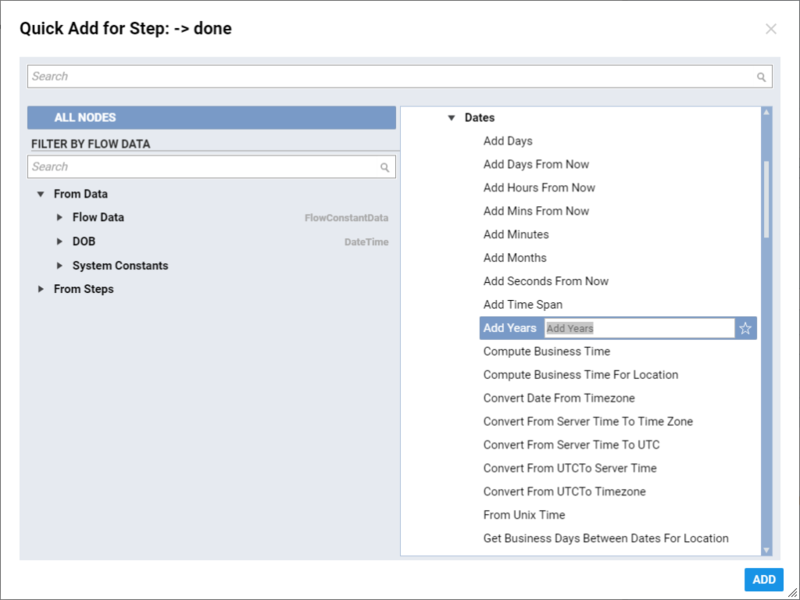 Next, we add Add Years	step from All Steps [Catalog] > Data > Dates	category. Add Years step takes in source Date (Date Time)	andyears (Int)	inputs. For source Date	we Select Value of our DOB	flow input and for years	we define Constant 18	. The output from this step will be a calculated date that we need to compare with current date and check if it is less than current date. 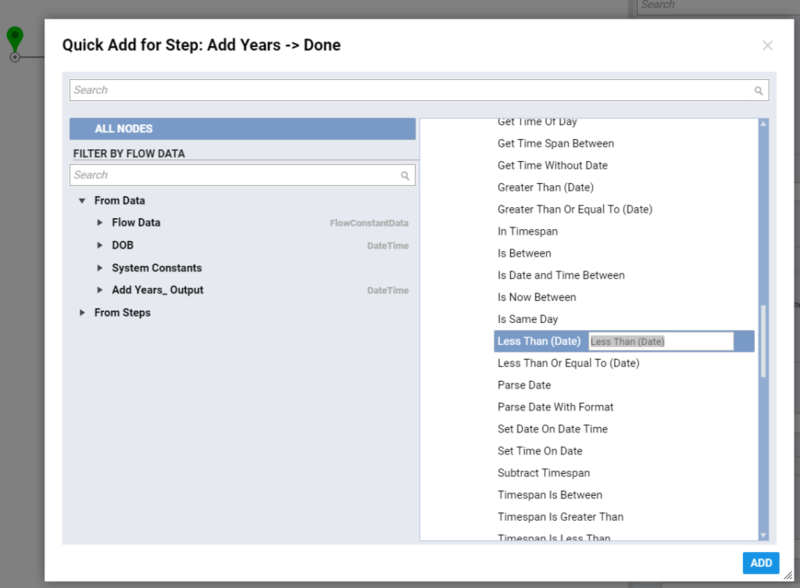 On the outcome path from Add Years	step we add Less Than (Date)	step from All Steps [Catalog] > Data > Dates	category. Next, we are going to configure Inputs forLess Than (Date)	step. For the end Date	input we select Current Date Time Mapping Type. For the first Date	input, we Select Value of Add Years_Output. 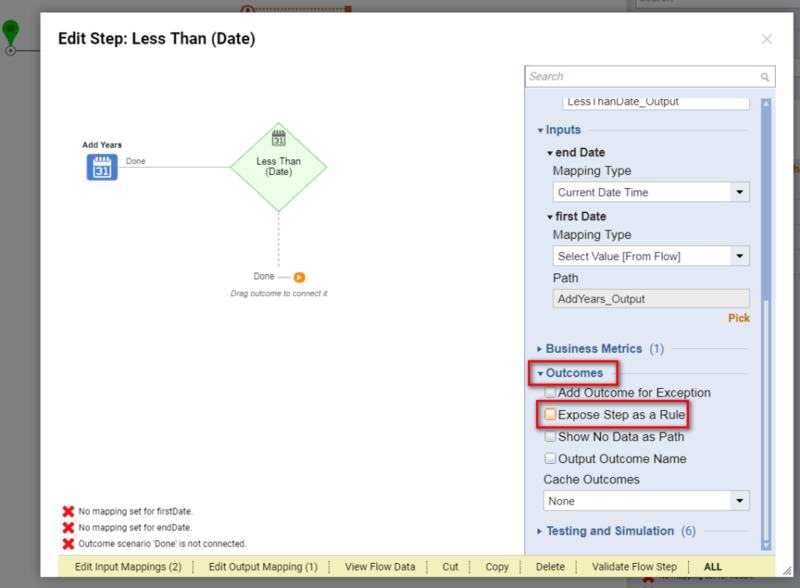 Then, we locate and expand Outcomes	settings on the Less Than (Date)	step and uncheck Expose Step	as a Rule	check-box. Next, we connect Done	outcome from Less Than (Date)	to theEnd Step	in our Flow . Our Flow has to output Boolean Result	(True or False) . For the Result	input on the End Step	we Select Value	ofLess Than Date_Output. This completes our evaluation Flow . We can save the Flow and closeFlow Designer. Back in the Rule Designer we click Done	to save and close Rule Step Builder dialog. Lastly, in order for us to be able to use this Rule as a Validation Rule	on the Form , we need to change its Behavior	. 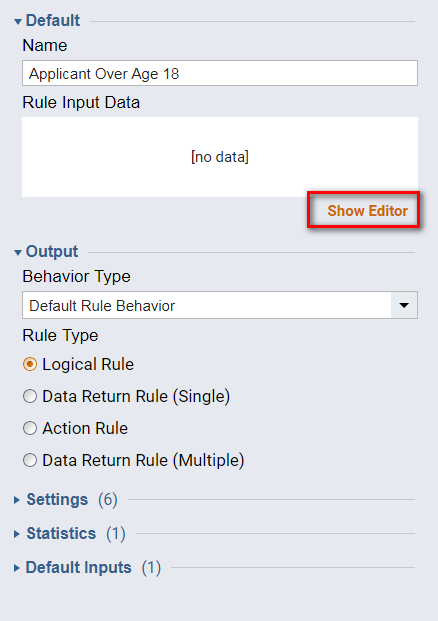 On the Rule Settings	panel we locate Behavior Type	in the Output section and pick Form Rule. This completes our Rule Design . We can save the Rule and close Rule Designer. The validation rule is established in the Form Designer , from the Surface level for the form. 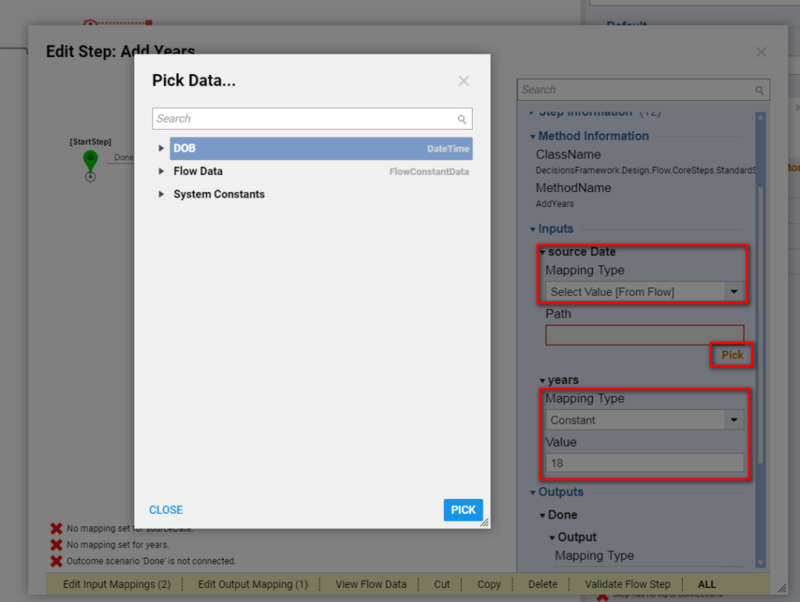 To learn how to apply the rule, see the topic "Applying a Form Validation Rule."